The Ohio State Department of Corrections oversees and manages the incarceration and subsequent community transitions of more than 51,729 inmates across 32 state facilities. Incarcerated persons in Ohio are supervised by 12,310 first line correctional officers who are committed to maintaining an environment of peace, order, and respect within the facilities where they work. In addition to state-run and privately contracted prisons, Ohio also has an extensive county jail system used to hold offenders before their trial and during shorter sentences. Finally, Ohio has one federal penitentiary, the Federal Correctional Institution at Elkton that draws on state resources for its operations. As the corrections industry evolves, it is no surprise that the state and national economists predict an upward trend in job creation throughout the state even as incarceration rates fall. Total roles for front line correctional officers are expected to exceed 12,900 in total by 2022. This prediction of economic growth, coupled with job vacancies due to senior officer retirement, attrition, and promotion, the state of Ohio has began an active campaign for correctional officer recruits. To learn more about this exciting field and opportunities in Ohio, read on. Greene County Vocational School District ranks 1st in our latest rankings with fifty-four students completing programs in criminal justice out of a total 208 graduates. Union Institute & University ranks 2nd in our rankings with 338 students completing programs in law enforcement administration out of a total 1,414 graduates in the 2012-2013 school year. Delaware Area Career Center ranks 3rd in our rankings with 60 students completing programs in criminal justice out of a total 346 students. Eastland-Fairfield Career and Technical Schools ranks 4th in our latest rankings with sixty-eight students completing programs in criminal justice out of a total 398 students from the 2012-2013 school year. Medina County Career Center ranks 5th in our latest rankings with nineteen students graduating from programs in criminal justice out of a total 124 graduates in the 2012-2013 school year. Butler Tech-D Russel Lee Career Center ranks 6th in our rankings with eighty-three students completing programs in corrections out of a total 544 graduates in the 2012-2013 school year. 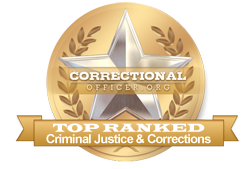 Tiffin University ranks 7th in our rankings with 150 students graduating from programs in corrections and law enforcement administration out of a total 1,792 graduates. Ohio University-Lancaster Campus ranks 8th in our latest rankings with 17 students completing programs in criminal justice out of a total 214 students. Buckeye Hills Career Center ranks ninth in our latest rankings with eleven students graduating from programs in criminal justice out of a total 166 students in the 2012-2013 school year. Polaris Career Center ranks 10th in our rankings with 31 students graduating from programs in criminal justice out of a total 518 graduates from the 2012-2013 school year. Urbana University ranks 11th in our rankings with nineteen students graduating from programs in criminal justice and law enforcement administration out of a total 358 graduates in the 2012-2013 school year. Kent State University at Stark ranks twelfth in our latest rankings with thirteen students graduating from programs in criminal justice out of a total 264 graduates. Zane State College ranks 13th in our latest rankings with forty-two students completing programs in criminal justice, criminal justice, and corrections out of a total a thousand students from the 2012-2013 school year. Remington College-Cleveland Campus ranks 14th in our latest rankings with twenty-two students completing programs in law enforcement administration out of a total 566 graduates. University of Cincinnati-Clermont College ranks 15th in our rankings with 42 students graduating from programs in criminal justice out of a total a thousand students in the 2012-2013 school year. Central State University ranks 16th in our rankings with 19 students completing programs in criminal justice out of a total 518 students in the 2012-2013 school year. University of Cincinnati-Main Campus ranks 17th in our latest rankings with 597 students completing programs in criminal justice out of a total seventeen thousand students. Defiance College ranks 18th in our rankings with 13 students completing programs in criminal justice out of a total 398 graduates from the 2012-2013 school year. Youngstown State University ranks nineteenth in our latest rankings with 131 students graduating from programs in criminal justice out of a total four thousand students. Scioto County Career Technical Center ranks twenty in our latest rankings with eleven students graduating from programs in criminal justice out of a total 382 graduates from the 2012-2013 school year. Candidates who pass the assessment portion of the hiring process will be contacted for an in-person interview at which time their satisfactory status will remain active for a period of 24 months. In this time, they may be scheduled for NEO (New Employee Orientation) at the start of their position. Employment will be finalized upon successful completion of the final phase of training. The state of Ohio is committed to serve and support correctional facilities in the state by encouraging growth in the field. The median income for front-line correctional officers throughout the state is higher at $42,600 than the median national income of $39,800. CareerInfoNet.org has published state and national trends at http://www.careerinfonet.org/occ_rep.asp?next=occ_rep&Level=&optstatus=011000000&jobfam=33&id=1&nodeid=2&soccode=333012&menuMode=&stfips=39&x=61&y=14 which predict that jobs in Ohio are at a 1% decline from now until 2022. The predicted job decline translates into approximately 340 jobs annually in the form of existing vacancies over the next decade. The table below lists career information collected by the Bureau of Labor Statistics for correctional officers in Ohio. The table is sorted by total employment, with the largest metropolitan areas listed first.